The sky is now the limit for the region of Murcia as its new airport has put the jets under the UK tourist numbers. The Region de Murcia airport in Corvera, officially opened by King Felipe VI in January, is expected to bring an influx of 20-25 per cent to the number of visitors to the region thanks to an increased flight capacity. The previous airport – based at San Javier around 30 miles away – was limited in its ambitions for tourism growth as it shared flight capacity with military flights. But as from April, the new site serves 22 commercial destinations in six countries with additional flight routes set to be added later in 2019, while Jet2 has already confirmed two new routes (each flying three times per week) from London Stansted and Birmingham for the summer of 2020. There are now regular flights to and from London Gatwick, London Stansted, Luton, Leeds-Bradford, Glasgow Prestwick, Bournemouth, Nottingham, Bristol and Manchester with Ryanair, Easyjet and Jet2 among the airlines to have moved their operations to the new airport. And that is expected to see a significant growth of visitors with 1.3m passengers set to use the new terminal during the course of 2019. 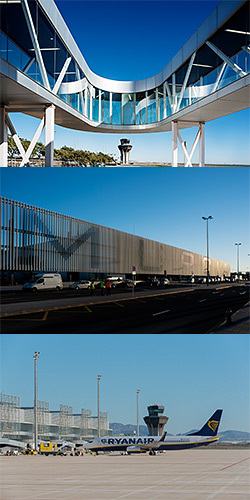 In its first full month of business for February 2019, more than 45,000 passengers used the new airport – an increase of 2.5 per cent from the corresponding month in 2018 recorded at San Javier. Of those passengers, more than 84 per cent were flights between the UK and Murcia. However, the number of UK visitors has seen a huge boost in the first two months of 2019 with a 30 per cent increase on 2018 figures for the same period and that upward trend is expected to continue throughout the year. The Costa Cálida, Región de Murcia is an ideal leisure and sport destination for UK travelers. The area offers year-round sunshine with an average temperature of 19.4°c and 315 days of sunshine per year. The picturesque region is just two hours from the UK by plane, in the south-east of Spain. Región de Murcia is in a privileged setting within the Mediterranean basin and includes 252km of coastline, known as the ‘Costa Cálida’ or warm coast. Visitors can take their pick from numerous sandy beaches; a variety of water sports and diving locations; 22 top-quality golf courses, all within easy reach of each other; delicious culinary delights; relaxing spas; and the opportunity to explore the beautiful countryside and regional parks. For more information, please visit www.murciaturistica.es/en or look for #VisitMurcia on social media.